Asian Disaster Reduction Center (ADRC)　Activities:IRP/ ADRC Attends International Forum on Recovery and Reconstruction of Sichuan Earthquake, China. IRP/ ADRC Attends International Forum on Recovery and Reconstruction of Sichuan Earthquake, China. 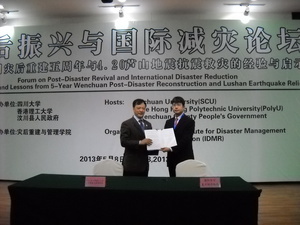 The Forum on Post-Disaster Revival and International Disaster Reduction -Experience and Lessons from 5-Year Wenchuan Post-Disaster Reconstruction and Lushan Earthquake Relief, organized by the Sichuan University, and the Hong Kong Polytechnic University, was held in Chengdu, China in May 2013. As a cooperation of this forum, the ADRC sent one representative from IRP secretariat to attend. The forum's over 300 participants included experts from government officials and academic experts across China. During the keynote speech, Mr. Shingo Kouchi, ADRC Senior Expert as well as IRP Senior Recovery Expert, valued the Government and people of China's high ability to promote recovery and reconstruction efforts following the Wenchuan Earthquake that struck Sichuan Province in May 2008. Mr. Kouchi also noted that ADRC and IRP have long been in help to China's efforts to utilize Japanese technologies, experiences, and lessons related to earthquake disaster risk reduction. Mr. Kouchi also emphasized the importance of everyday preparedness by citizens, in addition to the government efforts, when a massive disaster strikes. In this connection, the Lushan Earthquake which occurred in late April showed the evidence of progress of disaster reduction and preparedness since five years ago. (1) Promote personnel exchanges by mutual reception of research staff, faculty and students related to activities of both parties. (2) Give priority to research projects with mutual participation to promote collaborative research. (3) Promote the implementation of joint activities including the releasing and sharing of information on research results and professional knowledge. The ADRC, together with the IDMR, would like to continue to support efforts to strengthen the disaster reduction capabilities of the affected communities.